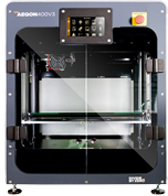 Divide By Zero’s Accucraft i250D is a hybrid dual extruder 3D printer with a build volume of 200mm × 250mm × 200mm. The high-performance dual extruders enable accurate print output, minimum post processing and make way for you to simultaneously work with two types of materials or colours options, thus broadening design possibilities. Housed in a robust sheet metal body, the Accucraft i250D is pre-assembled, calibrated and tested for easy 3D printing, right after installation. Accucraft i250D’s low-noise operation, super-fast slicer, quick-load functionality and industrial-grade build quality ensure fast and reliable print-cycles. Enabled with advanced features like USB, SD card, Ethernet and Wi-Fi allow seamless connectivity and the onboard camera allows remote monitoring of print batches. With a build quality optimised for efficiency, multi-material compatibility, low running cost and an easy-to-use interface, the Accucraft i250D delivers fast execution of design ideas in product design and rapid prototyping. 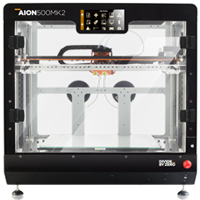 Harness the power of dual extruders to tackle complex design requirements with ultimate precision, reliability, and stability. Divide By Zero has meticulously pre-assembled, calibrated and tested the Accucraft i250D to deliver professional-grade 3D printing right out-of-the-box. 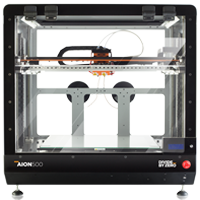 This industrial grade 3D printer is built for accuracy, reliability and affordability in the production process with a strict focus on precision and durability. With the Accucraft i250D, the complex 3D printer assembly process are a thing of the past. With Accucraft i250D, get world-class 3D printing right out of the box. Divide By Zero’s Accucraft i250D industrial grade 3D printer features high-quality all metal direct drive dual extruder mechanism that gives the users freedom of printing two different types or two different colours of the same materials simultaneously. The Accucraft i250D incorporates premium-grade HIWIN precision series linear guides along with a specially designed XY gantry that delivers positional precision of 16 microns and print speeds up to 200mm/sec. The machine easily delivers an overall print accuracy of ±80-150 microns and has delivered an accuracy of ±50 microns in ideal test environments. The Accucraft i250D features a 4-point semi-automatic bed levelling that takes less than a minute to get ready for the next print batch, making sure that you get repeatability and reprints of consistent quality and make. With the Accucraft i250D, get assured increase in productivity and save precious time in the fast-paced verticals of prototyping and production environments. The Accucraft i250D by Divide By Zero is housed in a high endurance and robust sheet metal body that maintains stable chamber temperature for controlled heat dissipation delivering seamless adhesion and uniform print consistency. As the Accucraft i250D is a dual extruder 3D Printer, one extruder prints the intended material while the other prints the support material. These support materials can easily be removed by dissolving it an organic solvent, making the post processing hassle free and easy with no manual intervention required. The Accucraft i250D offers easy compatibility with a wide range of industry-standard 3D printing materials material such as ABS, PLA, HIPS, PETG, Wood-infill, Metafill, Carbon Fiber, Polycarbonate and flexible Filaments among a list of others. Despite being an industrial-grade 3D printer, the Accucraft i250D is cost-effective and has a low running cost of Rs. 4/gm thereby offering tremendous value for money and return on investments. This compact yet powerful 3D printer can be connected via USB, SD Card, Ethernet and Wi-Fi. This allows users to get secure access to the machine’s control software, along with multi-user support. The Accucraft i250D features a built-in camera with internet connectivity (via Ethernet or Wi-Fi) to allow users to remotely monitor print queues easily giving them full visibility of the entire print process. Divide By Zero ensures that all its products are manufactured and tested while strictly adhering to the highest international quality standards in order to deliver industrial-grade 3D printing solutions to its customers. Our products come with a one year warranty and 2 days intensive product training along with unmatched after-sales support and technical assistance. PLA, ABS, HIPS, PET-G, CARBON FIBRE, Flexible Filaments, Woodfill, Metafill, Polycarbonate etc. 3 mins For 1 cubic cm part with 50% infill. It is very much convenient in operation, it is operating very smoothly and easily. It makes it very easy to visualise before going to the actual manufacturing and comparatively economical. I am very satisfied by the accuracy of the products from the 3d printer and in many cases there is little or no need for finishing after the print is finished. It has been helpful in making quick study models for designing of structures and designs for basic analysis. Director, Structures and Foundations Pvt. Ltd.
Good surface finish and strength. Gives a good scope for prototyping requirements. Thanks DBZ team for, Wonderful training experience; Especially to Imraan for such insightful experience sharing. We have learned a lot of maintenance issue. We look forward for only party meets in future. Training Provided by Divide by zero is absolutely very good & Pratik is also very co-operative Divide By zero is India’s good 3D printer Manufacture Company & we also look that one. In future we also required that 3d printer in big size stay connected with us. All the best, Good Luck! New age fire Protection Industries Pvt.Ltd.